Hotel Balcon del Caribe is located strategically on Santiago de Cuba’s historic Bay at less than 7 kilometers from downtown Santiago de Cuba, the colonial city with so much to see and do. One side the warm waters of the Caribbean Sea and on the other a rustic mountain landscape of astounding beauty. The UNESCO World Heritage Site of San Pedro de la Roca del Morro Fortress is within eyesight of the hotel and a first place to visit for guests who have recently arrived at Hotel Balcon del Caribe in Santiago de Cuba. Each room affords an unhindered expansive view of the Caribbean Sea and the pristine beach below. 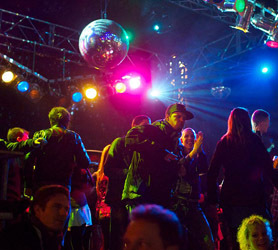 Guest have free access to the San Pedro del Mar Cabaret. Our booking process is unique because it shows the best rate from all of these for Balcon del Caribe hotel in Santiago de Cuba and the types of rooms available. Our Balcon del Caribe Santiago de Cuba rate comparison is an industry first for Cuban Hotels. Once you’ve compared the rates, finalizing the booking at Balcon del Caribe Hotel takes just seconds and an immediate confirmation is provided in real-time. 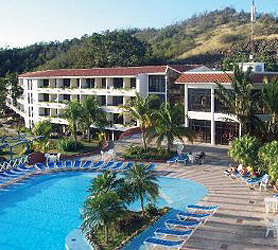 Hotel Club Bucanero Santiago de Cuba is incorporated inside the Baconao National park along its Caribbean Sea coastline and peppered inland by the exuberant mountains from the Sierra Maestra Chain. If you would like to visit Santiago de Cuba’s many sights by day but escape the crowded streets at night, the all-inclusive Hotel Club Bucanero Santiago de Cuba is a great choice. 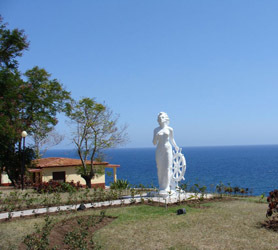 Just 40 km from the city center with regular shuttle buses to whisk you in and our of the city, the Hotel Club Bucanero Santiago de Cuba is an ideal base from which to discover the province and its many sights. Hotel Club Bucanero Santiago de Cuba is managed exclusively by the Cuban Gran Caribe hotel chain which is one of Cuba’s premiere resort management companies on the island. Our booking process is unique because it shows the best rate from all of these for Club Bucanero hotel in Santiago de Cuba and the types of rooms available. Our Club Bucanero Santiago de Cuba rate comparison is an industry first for Cuban Hotels. Once you’ve compared the rates, finalizing the booking at Club Bucanero Hotel takes just seconds and an immediate confirmation is provided in real-time. Cabaret Show emulating the famous Tropicana in Havana. 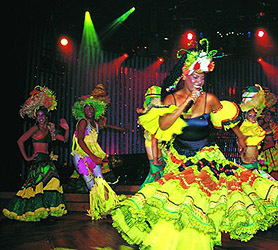 It’s second in size and fame only to Havana’s internationally famous Tropicana, but Santiago’s show is still brilliant in all aspects with excellent singers, dancers and entertainers. A Cabaret Show held right next to El Morro castle in Santiago de Cuba. 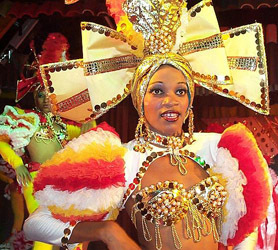 The Cabaret San Pedro del Mar has shows every night except Monday and Tuesday for just 10 cuc. Although they aren’t as exaggerated as others in the city, they’re well orchestrated and take place on a patio overlooking the ocean, providing that little more excitement. Cafe Santiago is held in the main disco of the hotel this place can get quite lively. The music is modern with the latest international disco sounds mixed with some authentic Cuban rhythms. Mainly for a younger crowd (especially later into the morning hours) it is more sedate during the early evening show between 10 and 11pm. Opening Hours: (Night) 10:00 p.m. a 3:00 a.m. 7 days a week. La Maison Santiago de Cuba is the home of the catwalk where Cuban models, both male and female show designers clothing by Cuban clothing designers. Some of the most beautiful people in Santiago de Cuba appear on the catwalk offering you a jaw dropping blend of blonds, blacks, mulatas and every other type of Cuban. You can buy the clothing modeled if you wish. Meals are good and reasonably priced and table waiters will attend to you. 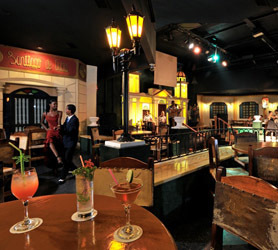 Located just beside one of the corners Cespedes Park, in the city’s historical center, you’ll see some top Cuban jazz groups performances earlier in the evening then this dark and sultry Disco turns into a heaving dance hall with modern disco tunes. Opening Hours: 7:00 p.m. a 3:00 a.m.
Held at the Hotel Rancho Club, this Cabaret show is for guests of the hotel but, we have not had any problems entering for free providing we were with a guest. Excellent show followed by a live band. If you call and request to visit based upon an upcoming possible stay at the hotel, they’ll usually let you see the show for free. 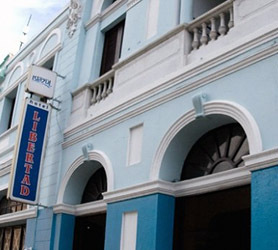 Hotel Libertad Santiago de Cuba is perfectly situated right in the center of Santiago de Cuba. Hotel Libertad is part of the fashionable Plaza de Marte square, which was used as a parade ground for military ceremonies and the slave trade throughout the colonial period. Hotel Libertad Santiago de Cuba offers “historic appeal” and true character due to it being located in a +100 year old building much like the the 4 star Hotel Casa Granda hotel which is just down the street. Hotel Libertad Santiago de Cuba offers very easy access by foot to sights such as; Heredia Street, Casa de la Trova Music hall, together with numerous museums such as the Museum of Rum, the Carnival Museum, the Museum of Poet José María Heredia and the Design Museum. Hotel Libertad is very busy during two of Santiago’s most important festivals and Carnival week, including the Fiesta del Fuego. Our booking process is unique because it shows the best rate from all of these for Libertad hotel in Santiago de Cuba and the types of rooms available. Our Libertad Santiago de Cuba rate comparison is an industry first for Cuban Hotels. Once you’ve compared the rates, finalizing the booking at Libertad Hotel takes just seconds and an immediate confirmation is provided in real-time. 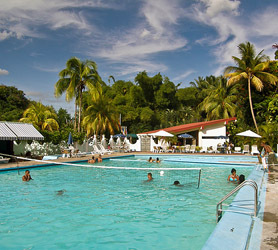 Hotel San Juan Santiago de Cuba is operated by Cuba’s budget hotel chain Islazul. With 110 rooms the Hotel San Juan is a reasonably sized hotel with plenty to do and excellent on-site entertainment facilities for young and old. Nestled in a beautiful forest yet just 4km (2.5 miles) from the city center, the Hotel San Juan in Santiago de Cuba offers the perfect blend of true relaxation along with easy access to the city and just meters from Parque Historico Militar in La Loma de San Juan, the site at which the final battles of the Cuban-Spanish-American war of 1898 took place. If you are looking for a central hotel with extremely good rates which is in close proximity t just about everything there is to see in Santiago de Cuba then Hotel San Juan is an excellent budget hotel. Our booking process is unique because it shows the best rate from all of these for San Juan hotel in Santiago de Cuba and the types of rooms available. 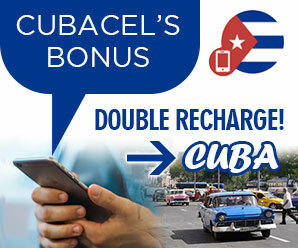 Our San Juan Santiago de Cuba rate comparison is an industry first for Cuban Hotels. Once you’ve compared the rates, finalizing the booking at San Juan Hotel Santiago de Cuba takes just seconds and an immediate confirmation is provided in real-time.